Posted January 26th, 2015 by David Porter & filed under Hot Topics, Social. There’s been lots of news and noise recently about the driverless car. This is the future and is hurtling towards us from all directions as companies race to corner the market and the public waits, wondering about safety and such like. Started in the USA, the idea is now approved for public trials in automated shuttles in the UK. The automated vehicle industry is being born. January’s International Consumer Electronics Show (CES) in Las Vegas featured one, a Mercedes-Benz F 015 ‘Luxury in Motion’ car, which is still at the ‘concept car’ stage of development. The widespread use of this kind of car will take some changes to thinking. The self-parking car may just be a great asset for many drivers. The computer guided routing and avoiding problems will be welcomed by most people. But to give up all human input? Some believe that driving will be safer without humans at the wheels. Cars will travel closer together, roads could be narrower, speeds all controlled constantly. Front seats will rotate so people can socialise with rear passengers, so in effect the car will become a ‘mobile living space’ rather than just a means of transport. Entertainment on tap, destination changing at will, infallible sensors on the outside keeping everyone safe – it all sounds idyllic. The car will be summoned by voice command or the flick of something on a watch. The concept on show at Las Vegas had speakers to give pedestrians approval to cross a road. Much of the technology simply builds on what is already available in the smarter, top end car. 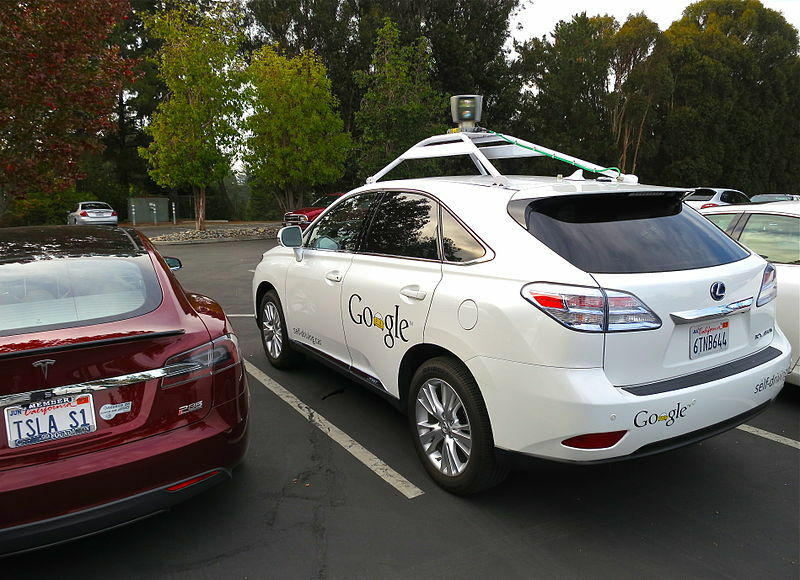 Google are well down the road with testing autonomous vehicles in California. Some incredible (or terrifying) speeds are possible, even in traffic, it seems. The fact that the idea is inevitable is not reassuring to all. Luc Olinga asked on Yahoo ‘does the sports car have a future in a soulless driverless world?’ What about motor racing across the world? Is there any value in vintage cars? And does it matter if in a generation people lose the manual, visual, dexterity, problem-solving and anticipatory skills currently involved in driving a car? Will it be the end of drink-driving as a social problem? Will it mean the end of the jaw-dropping insurance premiums young people are charged? In another development, a company based in Arizona, Local Motors, has unveiled the first 3D-printed car. 3D printing – now that’s another whole issue but the fact is, there seems to be little that cannot (or will not) be made by this process. So, a car is right, too. Tried out by the BBC and other news organisations, this is how it will be for the future, the company reckons. You wont go to a showroom or buy a car online. You will design your own within the legal and safety parameters, have it printed and delivered to your door. Presumably this idea and the driverless combination will soon merge, so you design and print one off, but a computer drives it for you?